These words begin artist Robert Smithson’s 1973 Artforum essay: “Frederick Law Olmsted and The Dialectical Landscape.” The article is illustrated with historic Park photos from the late 1800s and early 1900s. 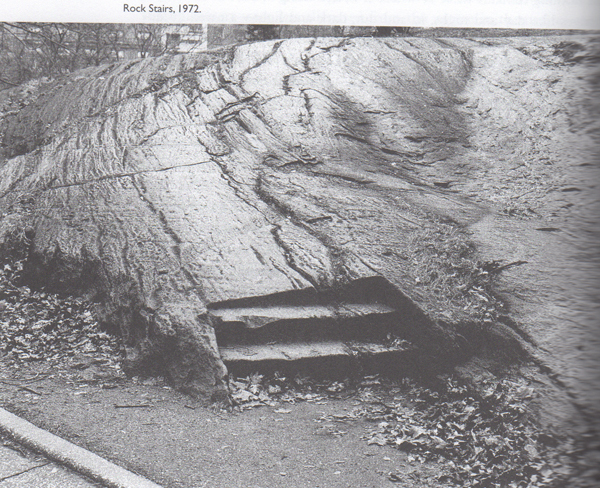 Smithson had taken a walk through Central Park in 1972, looking for visual evidence of the landscape designer’s attempt to create a “concrete dialectic between humans and nature.” Along the way he took several snapshots, including the one below. 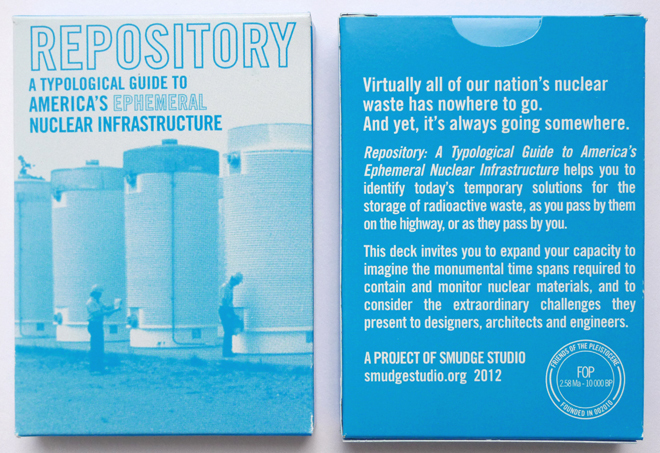 The steps in this image struck FOP as worthy of inclusion in our Geologic City project. In them, we sense a simple, but profound intersection between humans and the geologic. 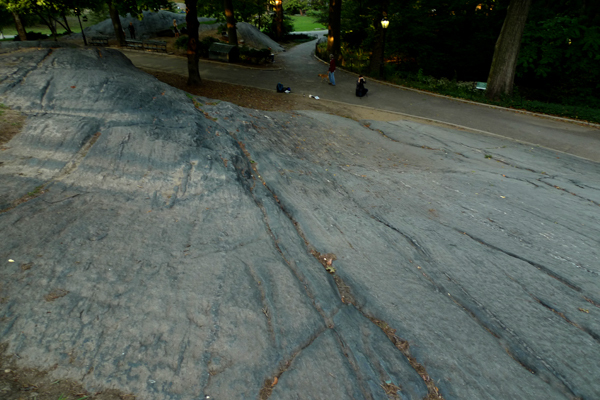 Here, Pleistocene glacier scoured Manhattan Schist lies bare at the surface of the urban landscape. And here, someone has designed an invitation for passersby to leave “the path” of the sidewalk and directly experience raw geologic materiality. The only problem for us was that Smithson offered no details about the location of the steps or how they came to be made. 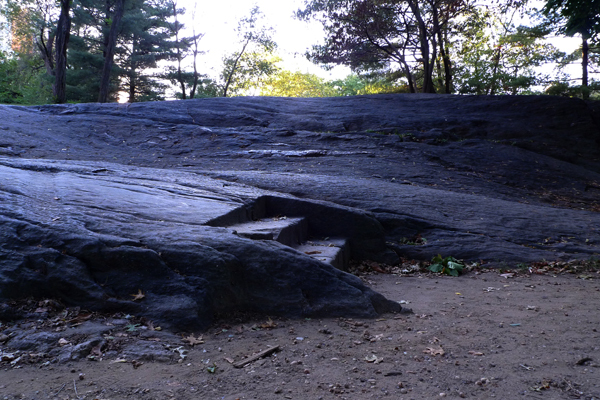 We had no idea where to find them amongst the many rock outcroppings in the 770 acres of Central Park. Despite email inquiries to the Park and an urban geologist, we found ourselves looking for the stairs at the southwestern end of the Park, but left without success. We honed our search further through a closer study of the photo: the site has buildings visible in the background and is located close to a sidewalk. A couple days later, on our second attempt, a Park police officer who thought the Smithson photo looked “vaguely familiar” sent us further south and east than we had been. This time we found them. Today Central Park is the most visited urban park in the United States, boasting 25 million visitors each year. In 1972, Smithson wandered within a less domesticated place. During his walk he was chased by wild dogs, saw tin cans and abandoned shopping carts sinking into ponds of mud and found the Ramble had become an urban jungle: “lurking in its thickets are hoods, hobos, hustlers.” During our visit, we found countless urbanites leisurely strolling, sleeping, exercising, picnicking and playing within the Park. The geologic materiality of the stairs seems to have quietly persevered within the ever changing urban landscape surrounding them. Other than the “third” step being slightly smoothed by humans shuffling across it for the past 40 years, the stairs look like they haven’t aged. We are finding it hard to date this site for Geologic City. The stairs appear to be another messy mix of vastly disparate spans of geologic time. 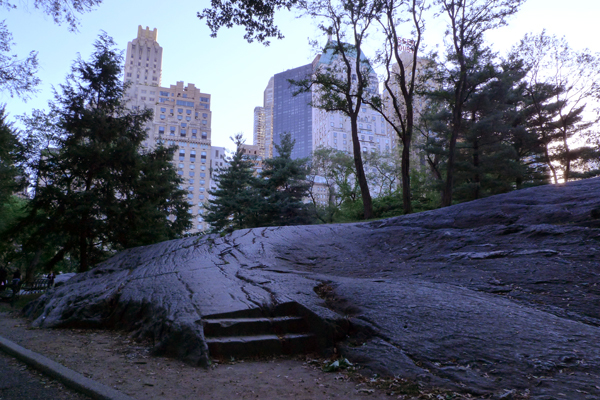 The outcroppings of Manhattan Schist are 450 million years old, but a historian at the Central Park Conservancy informed us that the stairs were likely carved in the early 1860s. Still, what we find most interesting and inspired about this “staircase” is its poetic futility. The stairs don’t provide “passage” or assistance in climbing as much as a shift in being. 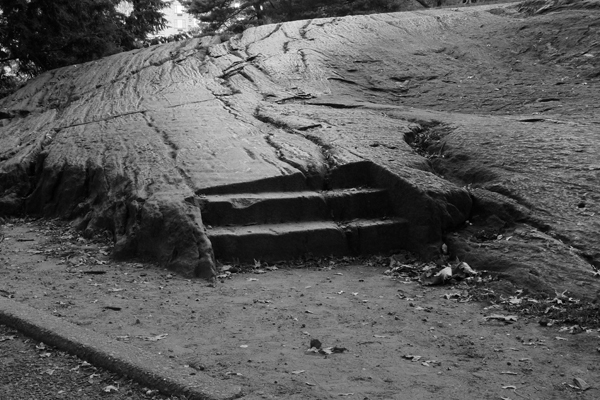 By “using” these stairs New Yorkers of today accept an invitation to make direct contact with the geology of the City. The stairs politely suggest that we break from the predetermined route of the sidewalk and head out and up onto the open space of the rock surface. What happens next is up to us. With the knowledge that the steps were designed by Olmsted and Vaux, Smithson’s words take on real meaning for us, especially as we continue to discover deeper connections between our contemporary artistic practice, geology and the architecture and infrastructure that make New York City. 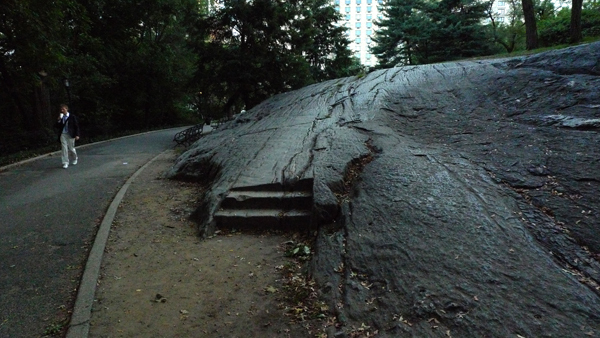 This particular Central Park rock outcropping-as-earthwork seems an apt place to consider these relationships.